15th April 2019 Pakistani FTA Aplus TV replaced by encrypted B4U Plus. Indeed, same glitch image on PTV Prime (11553 H 22000). FTA A Plus have been replaced by encrypted B4U Plus (11538 V 22000). 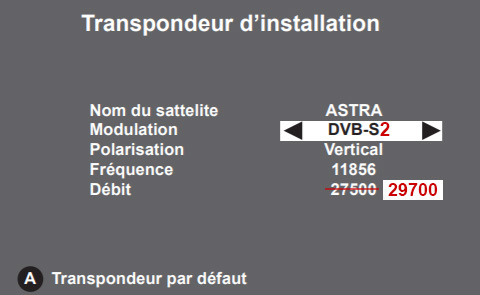 Satellites Astra 2E 2F 2G on 28.2º East. Frequencies and Channels. PTV Global is ok on Astra 2G 28.2° East and Eutelsat 9B 9° East. As for PTV Prime on Astra 2G 28.2° East there is a problem, indeed. Webmaster Thanks very much for your help, I think I might pay him a visit and see if it’s as good as he said, not that he might be telling any porky pies!!! Using a free-to-air satellite system... 140 cm seems to me too small to receive the Astra 2E/2F/2G UK Ku-band Spotbeams in Abruzzo, but there are very few reports on the map above, I don't know. Contact a competent local installer and tell us your experience. Thanks for you response. He stated that he is in central/south Abruzzo and is currently using a free view system . Where and when that expat was watching BBC One, BBC Two, BBC Four, ITV 1, ITV 2... in Italy with 140 cm dish ? Hi, I am living in central Italy. I had a discussion with another ex pat who said that he was watching U.K. free sat tv on a 140cm dish. I know absolutely nothing about satellite TV other than it sounds a great idea and one that would help with average internet TV coverage. In words that a Beano reader can understand, what are your thoughts before I spend any money and where is the best place to buy the required equipment. Hi how do i pay for those encrypted channels in Uganda kampala. I am in Menaka,Mali. I need satellite tv with Ukraine channels. Have mach it is coast and possibility to fiks it? Hi , can i receive 52.5 yahsat in germany berlin . if so, how big must the satellite antenna be? 3rd March 2019. IRIB Transponder 12437 H (Hot Bird) left. IRIB services continues on 10775 H (Hot Bird). hello I have a decoder strong it just had a malfunction and I have no more channels I would like to receive the Pakistani channels but problem whatever the settings it does not find any chain, must I update the case which has never been done, before proceeding to search the channels? 1st March 2019. Rai 4K again on Tivùsat. New frequency. -frisbee- and  K2 on 12634 V.
The new BBC Scotland channel launched on Sunday 24th February 2019 at 7pm. I'm not getting indian scramble channel nilesat7 last two month. From libya. Please help and suggest. 17th February 2019. IRIB Transponder 12437 H has been duplicated, same channels on 10775 H.
How do I receive these changes? I recently changed the TP for rti Canal 21 because it had changed. I now receive it well but it seems that there is no English programmes like before. Is it on another wavelength do you know? 5th February 2019 SD version BELARUS 24 left 11623 V 27500 3/4 DVB-S. HD version Belarus 24 HD continues on 11565 H 29900 3/4 DVB-S2 8PSK. A correct LNB skew angle adjustment or/and an accurate pointing at new orbital position 8.0° West could improve your satellite Eutelsat 8WB reception and fix your problem. I'm Really Upset, the New freq. on Nilesat are not working at all, Only 12604 is working ONLY !!! Another weird thing, on any other receiver device i could get the other frequencies (85% strength,70% Quality) but on BeIn(Humax) receiver i got (60% strength, 20% Quality) I used to get the Bein perfect before 1st of Feb.,2019 Guys, Really you are humiliating and torturing because we are using nilesat,,, why though ?!!!!! I'm at chad can i still receive bein sports signal on nilesat. Also the new ehail sat signals be received at my location. Which satellite can best suit my location. Thanks. With a large antenna like yours a very accurate alignment is required. New frequencies are on Eutelsat 8WB 8.0° W. Older ones were on Eutelsat 7WA 7.3° W.
Where are you ? How big is your dish ? Hi its ashame I lost all my bein sport channel and I just renewed full package few months ago. I am missing the football games!! !